1. Fire: Fire is beautiful and soothing to watch as it flickers and dances in a fire pit. But when you put this same fire into an enclosed barbecue, attach it to a propane tank, and stand directly over it, it can be a dangerous thing. Keep a fire extinguisher handy for any emergencies—that’s definitely barbecue safety tip number one. As well, read your barbecue manual. Barbecues cause hundreds of fires and injuries every year. Know how your barbecue works and how to cut the fuel supply quickly if you have to. Almost all barbecue fires occur because something has obstructed the fuel line. Follow all the barbecue safety guidelines outlined in your instruction manual. Every time you create a fire, it’s alive and potentially dangerous. Respect it and have someone monitoring it at all times. Keep a first-aid kit nearby with supplies for treating burns. 2. Food Preparation: Food needs to be kept cool until you are ready to throw it on the grill. This is especially true for meat. Don’t leave food sitting in the sun for an hour before you get around to lighting up the barbecue. Many people don’t actually realize how much time has lapsed from when they go outside to start the barbecue to the time when they actually grill the food. Hours pass quickly, and with every one, the risk of a foodborne illness rises. Warm food grows harmful bacteria at an exponential rate, so keep the food indoors until the grill is hot and ready. 3. Barbecue Safety: Beware of carcinogens. Although the smell of charred meat is not so bad, eating it is. Meat that has been charred is full of substances called heterocyclic amines. Heterocyclic amines are known carcinogens and have been linked to the onset of cancer. Avoid the urge to char your meat, and don’t overcook it. This is definitely a barbecue safety tip you need to abide by. If you do like meat that’s well-done, try this trick: use a marinade. Marinades can reduce the risk of creating amines by as much as 75%. 4. Beware of Grease: Grease will undoubtedly collect at the bottom of your barbecue. You need to clean away this grease. Grease and fire go together like barbecued steak and potatoes. As soon as your fire finds that grease lurking under the grill, it will set it off in a shooting flame. 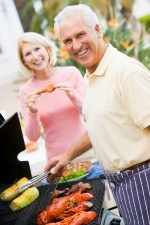 Prevent these sudden, dangerous flare-ups by regularly maintaining and cleaning your barbecue. 5. Attire: You might not realize this is an important barbecue safety tip, but it is. When you’re outdoors barbecuing, you may be standing in the sun for hours, or, if it’s nighttime, getting bitten by mosquitos. That’s why you should wear appropriate clothes for those conditions, and put on sunscreen and mosquito repellant—just make sure to wash your hands thoroughly after applying those before you start cooking. If you’ve followed all these barbecue safety tips, there’s only one thing left to do: enjoy! Anderson, K.E., et al, “Meat intake and cooking techniques: associations with pancreatic cancer,” Mutat Res. September 30, 2002; 506-507: 225-31.